The Kaduna State High Court sitting in Kaduna has ordered the remand of Sanusi Bello Dan-Inna and Hussaini Abubakar Musa, over allegations of fraud. The duo were recently arraigned before Justice M.T.M Tukur by the Independent Corrupt Practices and Other Related Offences Commission (ICPC) on a twelve-count charge bordering on obtaining money under false pretences, false representation and fraud. 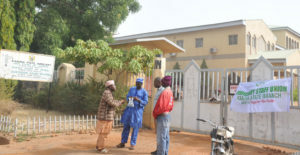 The charge, signed by Superintendent Dorothy Y. Suleman of Prosecution Department of ICPC, alleged that the suspects fraudulently obtained the sum of about N26million variously from unsuspecting members of the public, one of which was the complainant, Mainiyo & Sons Global Resources Nigeria Ltd.
Sanusi Bello Dan-Inna and Hussaini Musa allegedly received the money in 2017, under the pretext of facilitating the payment of mobilization fee for a contract to construct a mini stadium in Lere Local Government of Kaduna State. The two suspects were also alleged to have made a false receipt of Ministry for Local Government Council with Serial No: 11812 dated 13/04/2017 in the sum of N1, 000,000 issued to Mainiyo & Sons Global Resources Nigeria Ltd. The offences, according to prosecution counsel, Ms. Suleman, contradict the provision of Section 366 and Punishable under Section 365 of the Kaduna State Penal Code and Section 10(a) (ii) of the Corrupt Practices and Other Related Offences Act 2000. Following the accused’s plea of not guilty, the case was accordingly adjourned to 18th April 2019 for hearing. Justice Faji therefore ordered that the defendants be remanded in prison custody owing to their inability to meet their bail condition.